Automotive purists beware, you&apos;re about to finally be won over by the hybrid movement. Porsche has announced that its 918 Spyder is now available for order throughout its worldwide dealer network. The plug-in hybrid supercar will roll out with a 500hp V8, with an additional two electric motors mated and good for another 218 horses on top of the traditional block. While no official US EPA standards have been determined, Porsche is stating that the 918&apos;s hybrid powertrain should be good for about 78 mpg when it hits our shores in 2013. Feelin&apos; it? Good luck. Appropriately, a run of only 918 cars will be built; each one commanding a price tag of $845,000 plus destination. You&apos;re going to need a lot of solar panels to help you save that kind of coin. Still, with a 0-60 of 3.9 seconds and top speed of 199mph, it might be worth giving up the green of your yard. ATLANTA – March 21, 2011 --- After outstanding customer response to the concept car first shown at the 2010 Geneva Motor Show, Porsche today announced that dealers around the world will begin taking 918 Spyder customer orders. This is a significant step toward actual production of the company&apos;s next super sports car, a Porsche that marries unique plug-in hybrid technology and outstanding performance in a visually stunning and purely Porsche package. To ensure the 918 Spyder&apos;s worldwide exclusivity, Porsche will produce no more than 918 examples. Start of production at Porsche&apos;s famed factory in Stuttgart-Zuffenhausen is planned for Sept. 18, 2013 (9/18), and the U.S. base manufacturer&apos;s suggested retail price is $845,000 (excluding destination and handling charges). The 918 Spyder will be powered by a unique plug-in hybrid system that will include a high-revving, mid-mounted V8 engine with capacity of more than 4.0 liters and producing at least 500 horsepower. The engine will be based on the Porsche RS Spyder racing engine that demonstrated its impressive performance and efficiency through multiple Michelin Green X Challenge victories in the American Le Mans Series, the Le Mans Series and the 24 Hours of Le Mans. Power will be transferred to the rear wheels via Porsche&apos;s compact, seven-speed Porsche-Doppelkupplung (PDK) double-clutch gearbox. Two electric motors – one each on the front and rear axles – together will provide approximately 218 additional horsepower. This configuration also will offer an innovative, variable all-wheel drive system with independent control of the drive forces on both axles. Electrical energy will be stored in a liquid-cooled lithium-ion battery that can be recharged from a standard household outlet. Electric-only driving range is expected to be more than 16 miles on the NEDC. Recharge time will depend on each country&apos;s electrical power network, but charging is expected to take about seven hours at 110V/10A in the United States. A quick-charge option is being evaluated to further reduce charging times. With anticipated combined fuel consumption of just 3.0 L/100 km on the NEDC, this equates to CO2 emissions of only 70 g/km or 112 g/mile. On the other hand, the Porsche 918 Spyder will deliver super sports car performance. It is estimated that the final production version will accelerate from zero to 60 mph in about 3.1 seconds on its way to an estimated top track speed of 199 mph. It should also tackle Germany&apos;s famed Nürburgring Nordschleife in less than 7 minutes and 30 seconds, two seconds faster than the Porsche Carrera GT. 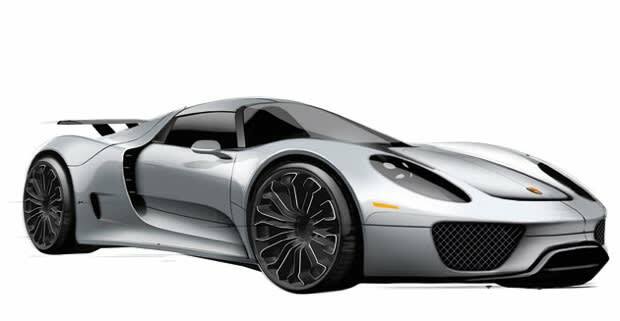 Under the right conditions, the 918 Spyder will be able to drive on electric power alone at speeds up to 94 mph for limited distances. Customers who order the 918 Spyder also have the opportunity to acquire a special-edition 911 Turbo S Coupe or Cabriolet. Also limited to no more than 918 units, the 911 Turbo S Edition 918 Spyder will have exterior and interior design elements echoing the plug-in hybrid 918 Spyder supercar&apos;s styling. It features similar exterior colors, carbon-fiber elements inside and out, enhanced leather equipment and numerous acid-green accents on items such as the brake calipers, illuminated sill plates, interior stitching and instrument cluster needles. A limited-edition badge on the glove compartment door will feature the same production number as the customer&apos;s 918 Spyder. Worldwide 918 Spyder customers can begin ordering this special edition 911 Turbo S sports car today, and customer deliveries will start later in 2011. The U.S. base manufacturer&apos;s suggested retail prices for the Coupe and Cabriolet versions are the same as the standard 911 Turbo S models, $160,700 and $172,100 respectively, excluding destination.